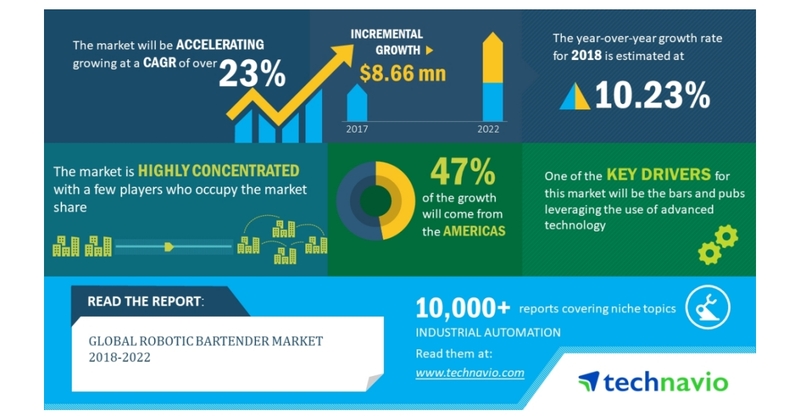 LONDON–(BUSINESS WIRE)–According to the latest market research report released by Technavio, the global robotic bartender market is expected to accelerate at a CAGR of over 23% during the forecast period. Bars and pubs leveraging the use of advanced technology is one of the key factors triggering the growth of the market. This research report titled ‘Global Robotic Bartender Market 2018-2022’ provides an in-depth analysis of the market in terms of revenue and emerging market trends. It also includes an up-to-date analysis and forecasts for various market segments and all geographical regions. In 2017, the Americas accounted for 46% of the global market and is projected to reach 47% by 2022, exhibiting over 1% increase in market share. Crowdfunding as a platform to raise funds is an emerging trend in the robotic bartender space. Crowdfunding platforms contribute to the growth of innovative and creative startups. Such platforms provide essential funding where potential investors provide startups with financial resources. The startup companies are backed by investors to help them in achieving their targets.